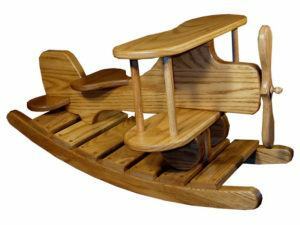 Rediscover the fun and personal fulfillment of person-to-person interactions around Amish wooden toys from Brandenberry. They’re great fun for kids and adults alike. And everything’s Amish made of solid hardwood. So they should last a long time. Plus, no batteries are needed! 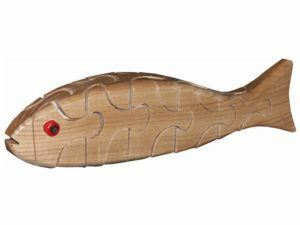 This handcrafted Baffling Bass Puzzle Ash is made from hardwood and is a fun brain-teaser! 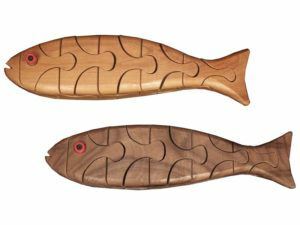 Catch this Baffling Bass Puzzle Cherry and Walnut and enjoy the challenge of taking it apart and reassembling it again. 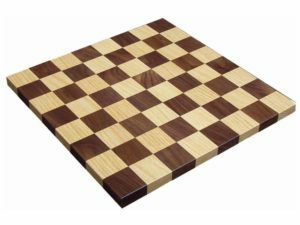 This Checker Board has a beautifully designed solid hardwood board that is perfect for a challenging game of checkers or chess. This Checker Board with Base is a deluxe board game. 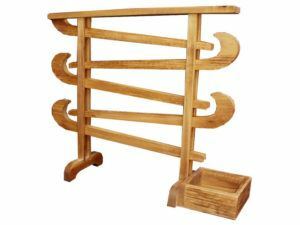 It is striking in its design and provides ample storage space for game pieces. 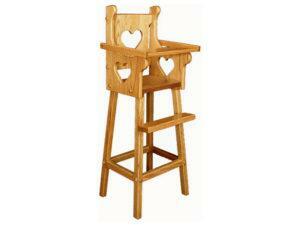 Doll Highchair with Heart Cut Outs in Oak wood. 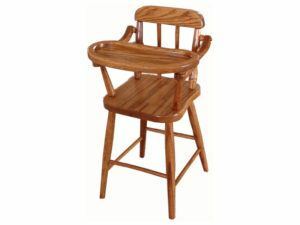 Solid hardwood Doll Highchair featuring a spindled back. 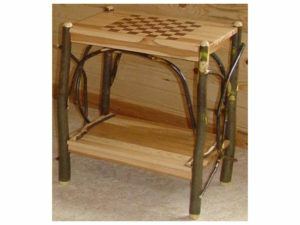 The Hickory Checkerboard End Table is truly like no other and will gracefully accent your home. Watch as marbles travel down along the solid hardwood track and collect at the bottom. 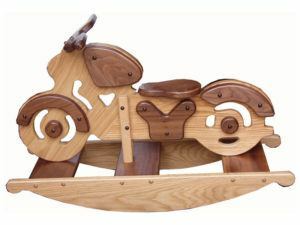 Motorcycle Rocker made of solid Oak and Walnut woods. 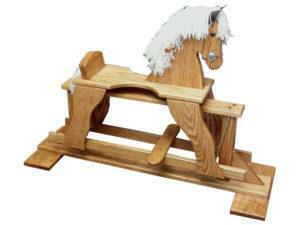 Solid hardwood Rocking Horse Glider. 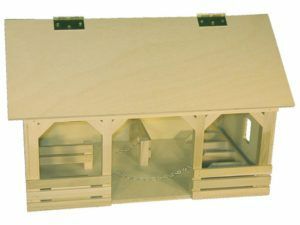 Add some toy animals to this barn and let your child’s imagination run wild. Presenting the internet’s premiere source of Amish wooden toys for kids of all ages. From Brandenberry Amish Furniture. 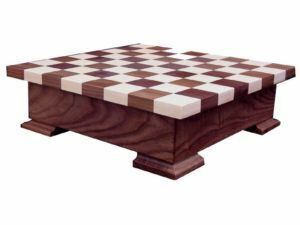 So whether you’re interested in solid wood puzzles, marble rollers or board games, you’ll find them here. Same with toy barns, rockers and gliders. 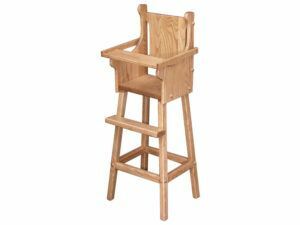 We even have baby high chairs. Fun for kids and adults. These solid wood children’s toys encourage children to use their imagination and engage in pretend play. And what a way to develop creative thinking skills! Plus kids never need to stop playing because batteries run out. 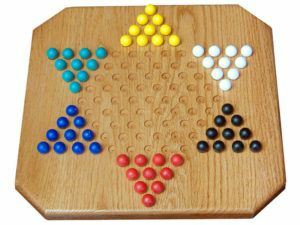 Notice also that we’ve got games like checkers and Chinese checkers. So you and your friends can enjoy spirited competition interspersed by snacks, laughter and friendly banter. Unique gifts. Our toys make great gifts for birthdays and holidays. This is because they’re so cool. Plus, you can’t find them in traditional outlets like big box stores. Also, we make each toy from solid wood. So they are ready for countless hours of rigorous play. All of this means you and your family will enjoy the wooden toys for years to come. Wish to check out cool items like our wooden rocking horse, wooden car toy and wooden horse toy for yourself? Visit our ‘brick and mortar’ store in Shipshewana, Indiana.